Parents and families of the 6 martyred members of Youth Parliament spoke at the occasion in addition to Mr. Wazir Ahmed Jogezai, former Deputy Speaker National Assembly, Speaker Youth Parliament and Member Youth Parliament Steering Committee; and Mr. Javed Jabbar, former Senator and Federal Minister for Information and Media Development. 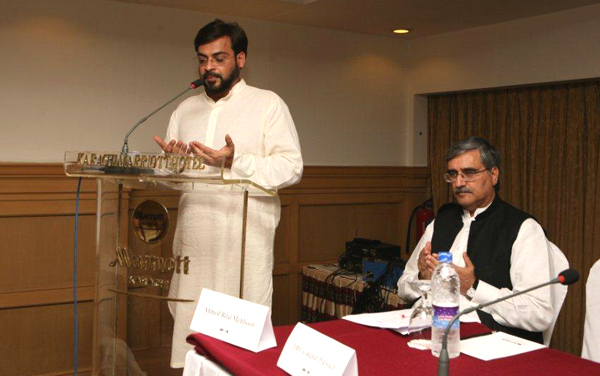 Mr. Amir Liaqat Hussain, former MNA, conducted dua at the ceremony. The 6 martyred members included Mr. Hassan Javed Khan (YP39-SINDH02; Blue Party) Youth Prime Minister; Syeda Rabab Zehra Naqvi (YP41-SINDH04; Blue Party) Youth Information Minister; Mr. Prem Chand (YP38-SINDH01; Blue Party) Youth Minister for Culture, Sports and Youth Affairs; Mr. Bilal Nasir Jamaee (YP44-SINDH07; Green Party) Youth Shadow Minister for Information; Mr. Owais bin Laiq (YP45-SINDH08; Green Party) Former Youth Shadow Minister for Information; Member Youth Parliament Standing Committee on Information and Syed Arsalan Ahmad (YP42-SINDH05; Blue Party) Member Youth Parliament Standing Committee on Information 2009-2010 Batch. Mr. and Mrs. Javed Khan, parents of Mr. Hassan Javed Khan; Mr. and Mrs. Murtaza Naqvi, parents of Syeda Rubab Zahra Naqvi; Mrs. Thakoram and Ms. Sangeeta N andlal, Mother and Sister of Mr. Prem Chand; Mr. and Mrs. Naseer Ahmad, parents of Mr. Bilal Jamaee, Mr. and Mrs. Laiq Ali, parents of Mr. Owais bin Laiq and Mrs. And Syed Ahmed Yahya, parents of Syed Arsalan Ahmad, participated in and spoke at the occasion. “Pakistan has lost 6 bright leaders,” said participants including parents of the 6 deceased young leaders. Our children believed they have to contribute to Pakistan and not just criticize it like everyone else, said parents. These 6 members were representative of the 80 million youth of Pakistan, said Mr. Javed Jabbar. The tragedy of the air blue crash has to be accounted for and it is unfortunate that the inquiry has been initiated using an innocuous clause of the relevant law. Youth Parliament is a nursery for the political education of youth of Pakistan, said Mr. Jogezai. I have been associated with the project for 3 years because of the hope it places on youth. My view of the future of Pakistan has changed due to Youth Parliament – if we have such bright youth, Pakistan has a bright future. Participants included Youth Parliament Alumni from the 3 batches including academia, friends and family of the 6 martyred members. You have lost your children but gained us all the three batches of Youth Parliament as your children, said Ms. Qurat-ul-Ain Marri, Member Youth Parliament 2007 Batch. You should be proud that your child was selected from amongst the youth of Pakistan to represent Pakistan. We are together as youth to lead the future of this country, following in the footsteps of the lost leaders, said Mr. Zameer Malik, Member Youth Parliament 2008-2009 Batch. We carry the spirit of our fallen heroes in us, said Mr. Shamas-ur-Rehman Alvi, Member Youth Parliament 2009-2010 Batch. We thank you for allowing us to share each others’ sorrow and grief, said parents of the martyred members. Truly the love and prayers we received from everyone after the incident is a huge support for us, said parents. Youth Parliament Pakistan (www.youthparliament.pk) is a PILDAT (www.pildat.org) project conceived and implemented since 2007 to inculcate the values of democracy and politics in the Youth of Pakistan.